Objectives: This study was conducted to evaluate the accuracy of ultrasound in comparison with standard X-ray for screening extremities fractures in adult population. Methods: This was a diagnostic accuracy study performed at the emergency department of Imam Khomeini Complex Hospital, Tehran, Iran. All patients ≥ 18-year-old admitted in the emergency department, with a recent history of trauma including any limb were included. The patients were first evaluated by attending emergency medicine physician using ultrasound and then underwent necessary X-rays. Subsequently, the reports were compared regarding calculating the accuracy. Results: One hundred twenty-eight patients with the mean age of 37.1 ± 14.9 years enrolled in the study (50.8% were male). The results showed an almost perfect agreement between ultrasound and X ray for detecting upper and lower extremity fractures in studied population (k=0.98). The duration of ultrasound was statistically shorter than X-ray (p<0.0001). The overall sensitivity, specificity and accuracy of ultrasound in detecting fractures were 97.4%, 100%, 99.2% respectively. When considering each bone separately, the lowest sensitivity and accuracy of ultrasound was for femur. Comparing the longitudinal and axial view of ultrasound, longitudinal view was more accurate (p<0.0001). Conclusions: It is likely that ultrasound could be an accurate and time saving alternative for x-ray in terms of extremities fractures screening in emergency department. Trauma is one of the most common cause of emergency department (ED) patientsâ referral. Skeletal injuries are among the most prevalent complications in such patients and Fracture probability varies markedly in different regions of the world [1,2]. Early fracture diagnosis in ED would lead to decrease the early and late complication rate, and ultrasound is wellknown, safe, rapid and noninvasive diagnostic device that could be used in this regard [3-6]. It has been highly regarded as a diagnostic instrument for bone fracture diagnosis and even some management. Use of ultrasound could be so valuable in radiation sensitive population like pregnant women, prehospital settings, nonverbal patients who cannot localize pain, and also in terms of decreasing serial x-ray imaging [7-9]. Several studies in this area is ongoing and more studies are still needed [10-12]. This study was conducted to evaluate the accuracy of ultrasound in comparison with standard X-ray for screening extremities fractures in adult population. The current diagnostic survey was conducted at the emergency department of Imam Khomeini complex Hospital, Tehran, Iran. Sampling was started following the study protocol approval with Emergency Medicine Department Research Council and Ethics Committee of Tehran University of Medical Sciences (TUMS). Informed written consents were obtained from patients. The authors were adhered to Declaration of Helsinki as a statement of ethical principles for medical research involving human subjects. Sampling was carried out in an accessible manner. All patients = 18-yearold referred to the emergency department, during first six months of 2014, with a recent history of trauma including any limb were included. Those with open fractures, penetrating trauma, severe crashed injury, or limb deformities were excluded. Considering a=0.05 and Ã=0.95 using formula below, the least sample size calculated as 30. A pre-prepared checklist containing the demographic and baseline characteristics was fulfilled for each participant. All the eligible patients were scanned by emergency medicine attending physicians or a senior resident. The researcher who were responsible for performing ultrasound exams were fully trained and had credentials in performing the emergency ultrasound based on point-of-care ultrasound curriculum guideline . The portable ultrasound machine used in this study was a SonoScape S6 with C352; 7.5 MHz linear array transducer. The point of maximal tenderness and edema which was clinically considered as a possible fracture site was scanned first in the axial and then in the longitudinal views. Any disruption of the bony cortex was considered as fracture . Their final diagnosis in each view and the duration of ultrasound scanning were then recorded in a separate sheet. The patient was then transferred to the radiology unit and all the standard X-ray views were taken. All the X-ray views were then reviewed by the attending radiologist and the reports were available in the Picture Archiving and Communication System (PACS) of the hospital. The results of the X-ray and the duration of patientâs placement on the X-ray machine till the end of the procedure were recorded in a separate sheet. The gathered data were inserted in SPSS version 21, and Kappa correlation was calculated for comparing the reports of ultrasound reports by emergency medicine physicians vs. X-rays reported by the radiologist. T-test was used to compare duration of each procedure. P-value < 0.05 was considered statistically significant in this study. One hundred twenty-eight patients with the mean age of 37.1 Â± 14.9 years (minimum 18 years and maximum 80 years) enrolled in the study (50.8% were male). Totally 54 (42.2%) visits were performed due to upper extremity trauma, and 74 (57.8%) cases were referred due to lower extremity trauma. Considering the duration of each diagnostic process, the mean Â± SD duration for ultrasound was 3.56 Â± 1.06 minutes compared to 18.28 Â± 6.28 minutes for X-rays. There is a significant difference in duration between these two methods (p<0.0001). The results showed an almost perfect agreement between ultrasound and X ray for detecting upper and lower extremity fractures (k=0.98, k=1.00). The overall sensitivity, specificity and accuracy of ultrasound in detecting fractures were 97.4%, 100%, 99.2% respectively. Presence or absence of fractures in participants diagnosed by ultrasound and x-rays are summarized in Table 1. The kappa correlation for axial and longitudinal ultrasound views of upper extremities and lower extremities were 0.9 and 0.96 respectively. The values are reported in number (%). Table 1. Presence or absence of fractures in participants diagnosed by ultrasound and x-ray (n=128). Statistical characteristics of ultrasound in detecting fractures in studied patients considering the presence of displacement have been reported in Table 2. The overall kappa correlation for ultrasound and X-ray in detecting fractures was 0.98 which is an almost perfect agreement. For displaced fractures, the kappa correlation was 0.90. Table 2. Statistical characteristics of ultrasound in detecting fractures in studied patients considering the presence of displacement. Comparison of axial and longitudinal ultrasound views in adults and pediatrics population considering the ultrasound view shows in Table 3. The accuracy of longitudinal view is 99.2% compared to 95.3% of axial view (p< 0.0001). The axial and longitudinal views of ultrasound and also anteroposterior and lateral views of one patient with radius fracture have been provided in Fig. 1. In this study, ultrasound views were also evaluated, and longitudinal view was more accurate compared to axial view. Table 3. Comparison of axial and longitudinal ultrasound views in adults and pediatrics population considering the ultrasound view. Fig 1. Axial and longitudinal view of a fracture of radius compared to the antero-posterior and lateral x-ray. Statistical characteristics of ultrasound in detecting fractures in studied patients considering each bone separately were summarized in Table 4. When considering each bone separately the sensitivity, specificity and accuracy are equal to 100% except for femur which was 50%, 100%, 88.9%, respectively. When evaluating each bone, the kappa correlation for all bones is 1 except for femur which is 0.6 with an accuracy of 88.9%. Considering the sample size, test sensitivity and calculated p-value, the power of the study was almost 0.9. Table 4. Statistical characteristics of ultrasound in detecting fractures in studied patients considering each bone separately. Considering the findings of this survey, fracture screening using ultrasound in ED has a high accuracy rate. Lots of studies have been done evaluating the use of ultrasound for detecting fractures. In a study by Marshburn et al. 58 patients with trauma to upper arm and leg were evaluated by ultrasound and plain X-ray or CT scan. The sensitivity and specificity of ultrasound were reported as 92.9% and 83.3%. However, in the mentioned study, physicians with an hour training evaluated the patients and this could explain the difference between the results as the emergency medicine attending physicians and the senior resident in this study were completely trained . Another study has suggested that with limited training of junior orthopedic residents, they are able to detect ankle fractures and this could reduce the need for radiographic imaging . According to a systematic review done in 2012, the overall sensitivity and specificity of ultrasound in detecting extremity fractures were 85-100% and 73-100% respectively . Our study also supports the result of this review. With regard to different ultrasound views, it has been suggested that scanning technique should include a longitudinal view and in order to reduce false positive cases, a transverse view could be used [6,18]. However, in these studies, these two ultrasound views have not been compared. Our study shows that longitudinal view is more accurate than transverse view. In this study, evaluation of femur bone in adult population was not as successful as other bones. This might be due to soft tissue thickness in this area or might be related to the fact that the fracture site was deeper than the depth that could be reached by linear probe. Bozorgia et al., conducted a diagnostic accuracy study to assess probable detecting femur bone fractures by bedside ultrasound and reported 90% sensitivity. Reviewing their methods level revealed that they were using a high frequency 10 to 15 MHz broadband linear array transducer that was different from what was used in our study . As well, Frouzan et al. reported high sensitivity of ultrasound for diagnosis of thigh fractures using 8-10 MHz linear probe . It seems that, there should be an issue regarding the tool properties. Therefore, conducting studies regarding the proper facilities characteristics would be explainable. The researchers conducting current study supports using ultrasound as a faster tool in ED to detect extremity fractures, but it could not totally replace x-ray. Maybe, in mass casualties, hand-held portable ultrasound could be used by physicians, paramedics and nurse practitioners as a good alternative for x-ray to screen for fracture and start the appropriate management of victims. Skill and experience have undeniable effect on the results of this study. Ultrasound was performed by fully trained emergency medicine physicians in this survey. It should be mentioned that ultrasound training is part of the educational curriculum of Emergency Medicine residency program. Further studies could be done regarding the evaluation of ultrasound accuracy by residents who do not pass any extra training course. It is likely that ultrasound could be an accurate and time saving alternative for x-ray in terms of extremities fractures screening in emergency department. Authors would like to appreciate close help and cooperation of the radiology department. Authors would like to show their deepest gratitude for those patients who voluntarily participate in this study. All authors passed four criteria for authorship contribution based on recommendations of the International Committee of Medical Journal Editors. Rosengren B.E., Karlsson M., Petersson I., et al. : The 21st-century landscape of adult fractures: A cohort study of a complete adult regional population. Journal of bone and mineral research. 2015;30:535-542. Lesnyak O., Ershova O., Belova K., et al. : Epidemiology of fracture in the Russian Federation and the development of a FRAX model. Archives of Osteoporosis. 2012;7:67-73. Barata I., Spencer R., Suppiah A., et al. : Emergency ultrasound in the detection of pediatric long-bone fractures. Pediatric emergency care. 2012;28:1154-1157. Ackermann O., Liedgens P., Eckert K., et al. : et al. Ultrasound diagnosis of juvenile forearm fractures. Journal of Medical Ultrasonics. 2010;37:123-127. Sabzghabaei A., Shojaee M., Manouchehrifar M., et al. : Ultrasound-guided reduction of distal radius fractures. Emergency (Tehran, Iran). 2016;4:132-135. Al-Kadi A., Gillman L., Ball C., et al. : Resuscitative long-bone sonography for the clinician: Usefulness and pitfalls of focused clinical ultrasound to detect long-bone fractures during trauma resuscitation. European Journal of Trauma and Emergency Surgery: Official Publication of the European Trauma Society. 2009;35:357. Saul T., Ng L., Lewiss R.: Point-of-care ultrasound in the diagnosis of upper extremity fracture-dislocation. A pictorial essay. Medical ultrasonography. 2013;15:230-236. Yousefifard M., Baikpour M., Ghelichkhani P., et al. : Comparison of ultrasonography and radiography in detection of thoracic bone fractures: A systematic review and meta-analysis. Emergency (Tehran, Iran). 2016;4:55-64. Farahmand S., Arshadi A., Bagheri-Hariri S., et al. : Extremity fracture diagnosis using bedside ultrasound in pediatric trauma patients referring to Emergency Department: A diagnostic study. International Journal of Pediatrics. 2017;5:5959-5964. Paulius K., Maguina P., Mejia A.: Ultrasound-guided management of hand fractures. Orthopedics. 2008;31:155-162. Shojaee M., Hakimzadeh F., Mohammadi P., et al. : Screening characteristics of ultrasonography in detection of ankle fractures. Emergency (Tehran, Iran). 2016;4:188-191. Bozorgi F., Shayesteh A.M., Montazer S., et al. 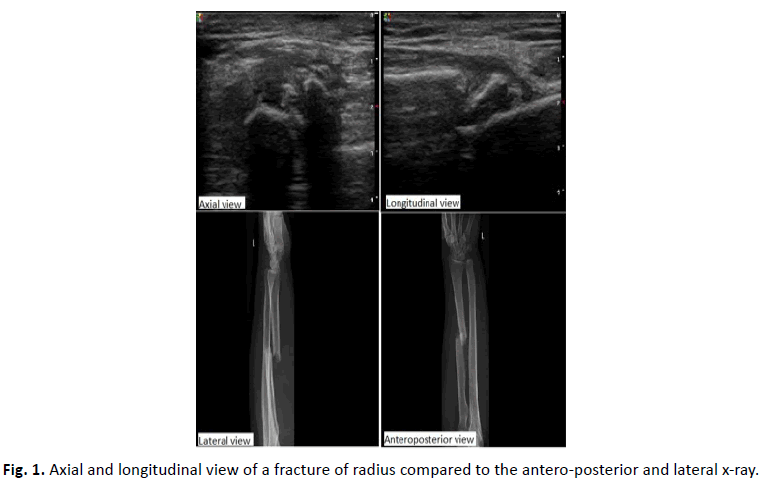 : Ability of ultrasonography in detection of different extremity bone fractures: A case series study. Emergency (Tehran, Iran). 2017;5:e15. Atkinson P., Bowra J., Lambert M., et al. : International Federation for Emergency Medicine point of care ultrasound curriculum. CJEM. 2015;17:161-170. Clare D., Joyce M., Creditt A.B. : Musculoskeletal ultrasound. clinical ultrasound. Springer; 2018. p. 113-133. Marshburn T., Legome E., Sargsyan A., et al. : Goal-directed ultrasound in the detection of long-bone fractures. The Journal of trauma. 2004;57:329-332. Hedelin H., GoksÃ¶r L., Karlsson J., et al. : Ultrasound-assisted triage of ankle trauma can decrease the need for radiographic imaging. The American Journal of Emergency Medicine. 2013;31:1686-1689. Joshi N., Lira A., Mehta N., et al. : Diagnostic accuracy of history, physical examination, and bedside ultrasound for diagnosis of extremity fractures in the emergency department: A systematic review. Academic emergency medicine: official journal of the Society for Academic Emergency Medicine. 2013;20:1-15. HÃ¼bner U., Schlicht W., Outzen S., et al. : Ultrasound in the diagnosis of fractures in children. The Journal of Bone and Joint Surgery (British Volume). 2000;82:1170-1173. Bozorgia F., Azarb M., Montazera S., et al. : Accuracy of ultrasound for diagnosis of femur bone fractures in traumatic patients. Journal of Clinical & Experimental Orthopaedics. 2017;3:27. Frouzan A., Masoumi K., Delirroyfard A., et al. : Diagnostic accuracy of ultrasound in upper and lower extremity long bone fractures of Emergency Department of trauma patients. Electronic Physician. 2017;9(8):5092-5097.